As soon as my eyes caught sight of his beautiful edition of Aesop's Illustrated Fables on a shelf in Waterstones I knew I had to have it. I'm not one to particularly seek out a specific cover of a book, if I have a series I don't mind if they're not all the matching covers and I don't mind second hand books that are a little tatty around the edges because it shows they've been read and loved. But occasionally there are editions of books that really catch my eye and this is one of those. Last year was the year I rediscovered my love of books and I suppose I wanted a little memento to remind me of that in years to come. If I'm ever lucky enough to have a child, I hope that when they're old enough to understand them, this might become a favourite bedtime story book to dip in and out of. Until then, I'll be keeping this on my bedside table for when I need a few words of wisdom to set me back on the right path. I have a feeling this will be getting a post of its own at some point next week, I can't stop photographing it because it's so beautiful. Love Hearts & Crosses is one of my favourite online boutiques because not only is there something for absolutely everyone hidden amongst the pages waiting to be discovered, Conny, the lady behind it all is so incredibly lovely and I think she deserves every success. It's truly a treasure trove of a website. Conny recently unveiled the most adorable origami animal jewellery collection I have ever seen with silver, gold and rose gold pieces. The rose gold bunnies are my favourite and since this necklace arrived in the post yesterday morning I haven't taken it off. I'm currently wearing it with my very fetching fluffy pyjamas, I love it so much! 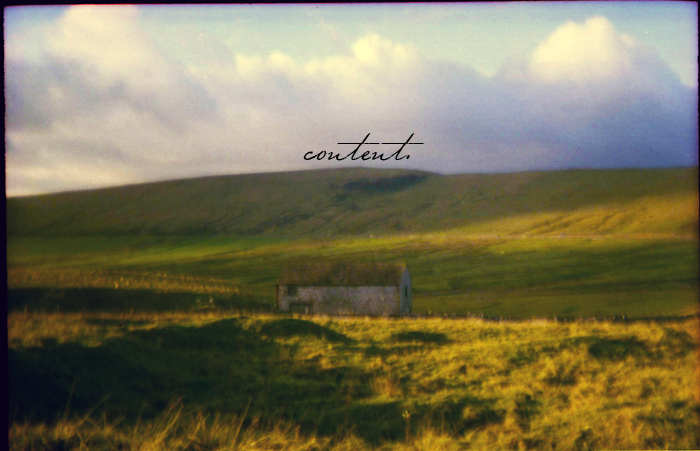 It's nice to feel content. You play a huge part in that, you know, I hope you know that. The love and support you've shown me over the years never ceases to astound me, and especially over the last few days, your comments and kind words have meant the world. I feel hopeful and happy and curious and eager to learn new things. And I'm so grateful for everything that I have that even though it would be nice to win the lottery to feel a little more secure, it would be nice for the slightly painful blemish on my chin to politely vacate my face, and it would be nice if my glass of apple juice would magically refill itself whenever I finish it, it's okay that those things haven't/won't/will probably never happen. It's been especially cold outside these past few nights. I've been reaching for extra blankets and fluffy socks even though I don't really like sleeping with socks on because I like to feel the crisp sheets under my toes. 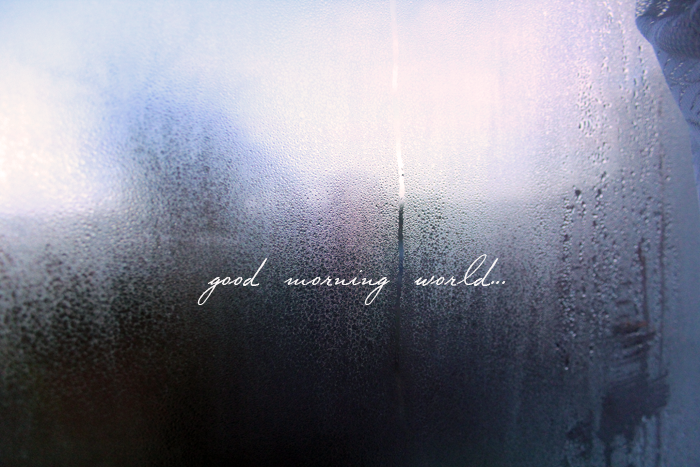 Waking up and opening the curtains to find my window misted up is one of my favourite moments of the day. Even though I'm so familiar with the view outside, the condensation creates such a beautiful mysterious atmosphere and the warm dim light from the sunshine is diffused by all the little droplets. It's almost as though I could wipe it away and for there to be a whole new landscape outside. Of course though, it's always the same. And it's comforting and reassuring to see the familiar rolling hills in the distance. You know when you hear someone sing for the first time and it just blows your mind? I think his album is going to be insane. What has been your favourite thing about this week? I was going to buy that book the other day! And Rose Gold is my favourite! How cool is your blog! I LOVE the design! Aww thankyou very much for the mention Jennie! I love the look of that edition of Aesop's Fables. I really am a sucker for the aesthetics of a book. It's actually something of a downfall, I want to read Rebecca by Daphne Du Maurier and have seen the most gorgeous edition online, but I can't find it to buy anywhere and I don't want to buy a less lovely edition when I know that beautiful one's out there somewhere... It's not the best habit. I love Sam Smith! I really don't fancy waiting till May for his album but I suppose great things take time. Wow, that is a lovely edition of that book! I'm like you - tatty books are special because they have clearly been loved, but sometimes it is nice to have a lovely copy of your favourite book. My sister bought me my good copy of Pride and Prejudice at Jane Austen 's home, and I love it! I love that edition of Aesop's Fables! I was eyeing up the Alice in Wonderland hardback that was in the same range, but as I've already got two editions on the shelves I just couldn't justify it to myself. It's a stunning collection! What a beautiful post. Lovely images and balance between the little things in life that go unappreciated, to more tangible things to bring a smile to your face! The necklace is so pretty and the book looks divine! Wonderful post! Beautiful edition of Aesops fables! I can't believe it is already Friday. The days are passing so fast. That bunny necklace it gorgeous & unusual. So to is the book. The cover illustration is very pretty. That version of Aesop's fables is absolutely gorgeous :) Great find! That cover is just gorgeous! I'm the same about books, I quite like it if they're a little tatty and well-loved, but every now and then something like that has to be splurged on! That book looks so nice & it's perfect for a table piece and practical to read as well :) I hope you have a good weekend! 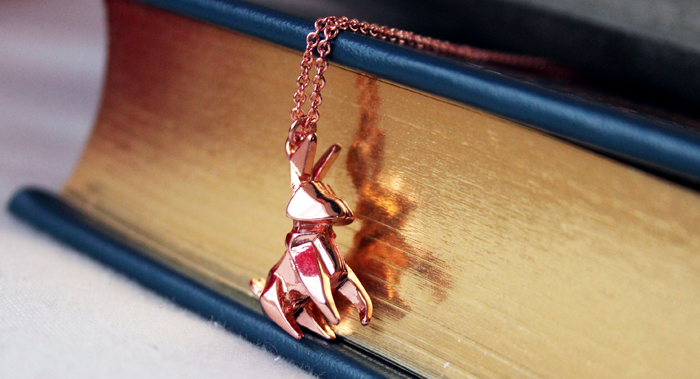 That necklace is so pretty and I love that it isn't a regular bunny but an origami bunny! Love that necklace! I pick books like that up for the kids all the time, I hope they will stay in our family for years and be enjoyed! Awwh wow that bunny necklace is stunning! I really like the elephant necklace as well :) might have to treat myself. oh my gosh the book is incredible gorgeous! Thanks so much for the mention lovely!! 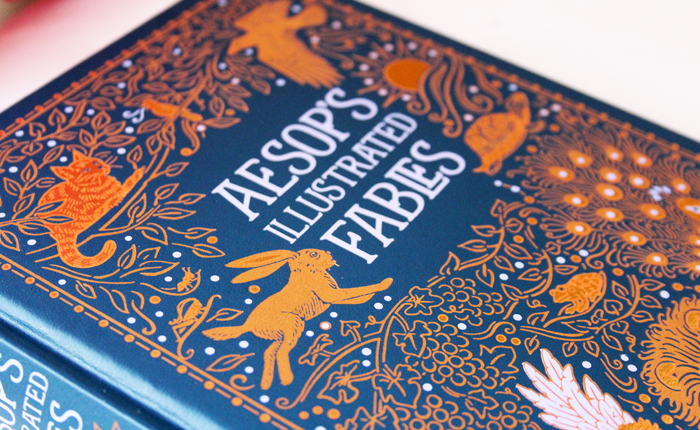 And that Aesop's Fables book is wonderful, I wouldn't stop photographing it either! Beautiful necklace too, so unique. ohhh the bunny necklace is so cute! love these things you've listed! I just found your blog, it's very nice. Keep it up with the good work! Shall have to check out those blogs, don't think I follow any of those. That Aesop books looks beautiful! What a gorgeous book cover, it's absolutely stunning. I'm a sucker for beautiful illustrations. It's great you're find the time to read, I'm hoping to discover a few more books this year. I'm thinking of getting a Kindle too as I move to manchester for a few months soon and carrying all my books will be a tad crazy on the journey! I feel a heck of a lot more content this year, it's a good feeling. I just hope it evolves a lot more into pure bliss and joy! One step at a time though! Thanks for your congratulations too on the driving test, I'm a person filled with anxieties so I never thought it would be possible haha! Sam's voice is silky smooth! Have you listened to John Newman? I can't control having a bit of a jive when ever I listen to him, stunning voice. I can't get over how beautiful that book cover is - definitely something you'd want to pass down to your children and grandchildren! Also, you're probably the only person I've ever heard of who likes early morning window condensation; I bloomin hate it, haha! The rose gold bunny looks adorable!!! That edition of Aesop's Fables is so pretty, I recently bought a copy of I Capture the Castle purely because it looks beautiful and I know I will get some extra satisfaction out of reading it, there is much to be said for a book which has a beautiful cover!